The Federal Reserve reported March 7, 2013, that aggregate household net worth at the end of 2012 was $66.1 trillion, nearly back to its precrisis peak of $67.4 trillion, reached at the end of the third quarter of 2007. After falling to $51.4 trillion at the end of the first quarter of 2009, the subsequent increase of $14.7 trillion through the end of last year represented a recovery of 91 percent of the losses suffered. Does this mean that the financial damage of the financial crisis and economic recession largely has been repaired? The simple metric of aggregate household net worth is misleading for at least three reasons. First, the effect of inflation is ignored. Consumer prices increased about 2 percent per year in the five and one-quarter years since the third quarter of 2007, reducing the purchasing power of a dollar by a total of about 10 percent. Therefore, a return to the previous nominal dollar peak does not mean that a given amount of wealth could buy as much as before. Second, simple aggregate net worth does not adjust for population growth. The number of households increased by about 3.8 million between the third quarter of 2007 and the end of 2012, or about 3.4 percent. The wealth of all American households now is shared by more families than before. Third, the recovery of wealth has not been uniform across families. Of the total recovery of $14.7 trillion between the first quarter of 2009 and the fourth quarter of 2012, $9.1 trillion, or 62 percent, of the gain was due to higher stock-market wealth. Stock wealth is unevenly held, with the vast majority of stocks owned by a relatively small number of wealthy families. Thus, most families have recovered much less than the average amount. 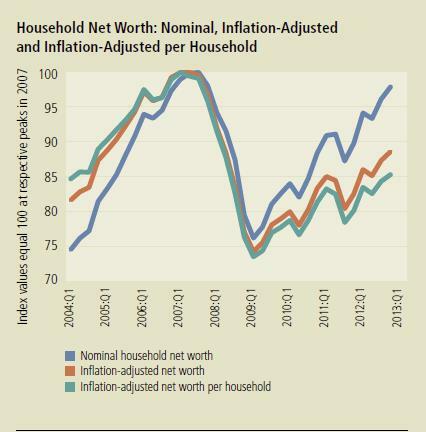 The figure and table provide details of three different measures of household net worth—aggregate nominal net worth, as reported in the Flow of Funds accounts; aggregate inflation-adjusted net worth; and average inflation-adjusted net worth per household, a household-level measure consistent with the data format in the Survey of Consumer Finances as discussed in this article. Clearly, the 91 percent recovery of wealth losses portrayed by the aggregate nominal measure paints a different picture than the 45 percent recovery of wealth losses indicated by the average inflation-adjusted household measure. Considering the uneven recovery of wealth across households, a conclusion that the financial damage of the crisis and recession largely has been repaired is not justified.